Can Kazam pull a rabbit out the hat with its affordable smartphones? 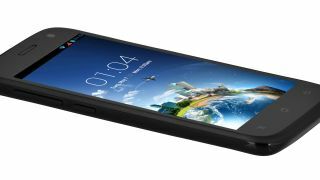 Startup mobile manufacturer Kazam has finally announced the smartphones it'll bring to the UK in the second quarter of 2014, with six reasonably priced devices to choose from. The first two phones are part of the mid-tier "Thunder 2" range - the 4.5-inch Kazam Thunder 2 4.5L and the 5-inch Kazam Thunder 2 5.0. Looking at the Thunder 2 4.5L you get a 854 x 480 resolution display, 1.2GHz quad-core processor, 8GB of internal storage, 8MP rear facing camera, 1.6MP front camera and 4G connectivity. Meanwhile the Thunder 2 5.0 comes with a HD 720 x 1280 display, 1.3GHz quad-core processor, 4GB of internal storage, 13MP rear cam, 5MP front cam, but no 4G support. Both handsets feature 1GB of RAM, microSD and dual-SIM slots. Kazam was unable to confirm pricing, but both handsets are likely to fall comfortably below the £300 mark. "Trooper 2" is Kazam's low-end range which comprises of four dual-SIM handsets in screen sizes 4, 4.5, 5 and 6 inches. These handset share lots of the same specs - a 1.3GHz dual-core processor, 512MB of RAM, 4GB of internal storage, stock Android 4.2.2, 5MP rear camera and 0.3MP front facing camera. The Kazam Trooper 2 4.5, 5.0 and 6.0 all have the same 854 x 480 screen resolution, while the Trooper 2 4.0 has a 800 x 480 setup. Kazam's focus however, is less on the specs of each individual device and more about offering customers an affordable handset with additional benefits. For now those benefits are one free screen replacement if you break it within the first year and its free Rescue service which can be called upon if you run into difficulties with your device. Kazam announced its presence back in November 2013, but it's taken until now to rally the troops and get its devices through the UK's lengthy approval process.